New England Bites: Knock, knock. Who's there? Sweetbread! Knock, knock. Who's there? Sweetbread! Believe it or not, most of our wonderful fans are not from Fall River. They're located in other cities, states, and even overseas! Many fans have found our website from doing an Internet search for foods exclusively found in this area. One of the more popular searches is for Portuguese sweetbread. For those of you that can't drive all the way back to the city (that means you, Ray in Vegas), fear not! 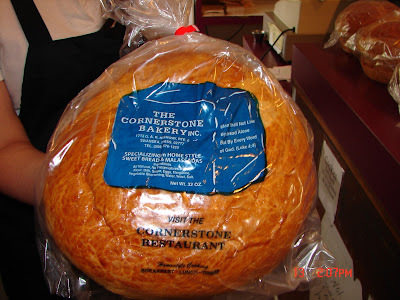 Cornerstone Bakery and Restaurant in Swansea - which has the best sweetbread around - is willing to send the sweetbread to you. Click here to find out more about how you can enjoy a big ol' hunk of moist, tasty sweetbread dripping with melted butter for breakfast in just a few days.